Retirements from MARSOC for Marine and mans best friend! For an average service member, it takes an obligation of 20 years to retire from the military. For their furry four-legged counterparts, it takes over 30 years to accomplish the same goal in dog years of course. Marine Corps working dogs date back to Nov. 1, 1943, during World War II when 1st Marine War Dog Platoon out of Camp Lejeune, North Carolina attacked the beach of Bougainville, Solomon Islands. U.S. Marine Corps Staff Sgt. 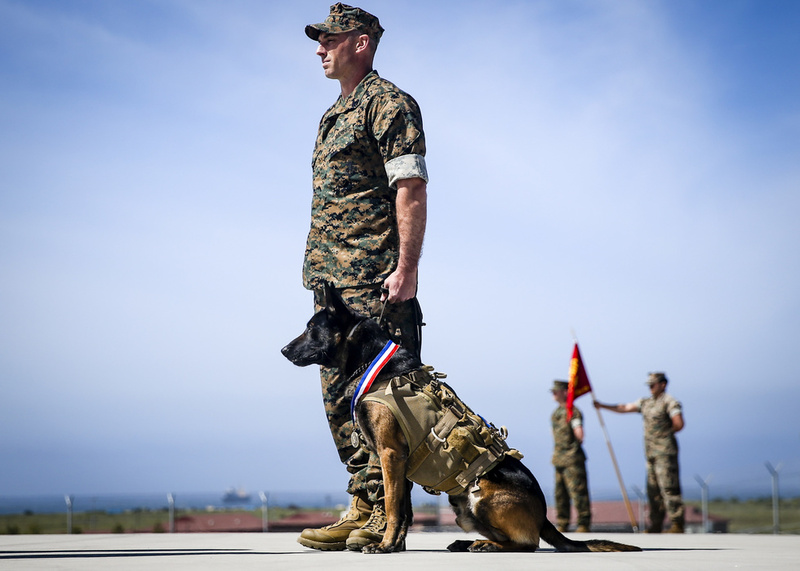 John Koman, a multi-purpose canine handler with Delta Company, 1st Marine Raider Support Battalion, U.S. Marine Corps Forces Special Operations Command, awaits command during the retirement ceremony of his multi-purpose canine, Roy, at Marine Corps Base Camp Pendleton, California, March 29, 2019. This article originally appeared on Marines. Follow @USMC on Twitter. Greatest Product Ever – Woobie Hoodie!